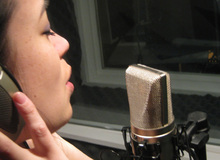 In this new installment of the chapter dedicated to vocal recording we will tackle the delicate issue of performance. Do you think that AC/DC's smash hit "Highway to Hell" was recorded by Bon Scott in the same state of mind as John Lennon's "Imagine"? Or that Lennon himself performed his pacifist hymn with the same enthusiasm as he did "Twist and Shout"? Along the same lines, does Freddie Mercury convey the same emotion on "Who Wants to Live Forever" and "Princes of the Universe" from the "A Kind of Magic" album? It's hard to try to give a constructive critique of a performance when you have no clue what is supposed to be interpreted, right? This statement of the obvious is a great excuse to ask the lyricist and composer their opinion of the text, in the presence of the singer. Usually, they will all agree on their opinion since all three of them are probably the same person. But ask them anyway, because not only will this help you to assess the quality of the performance during the recording but also to help you take the recording where it's meant to go, while at the same time reinforcing the confidence between the two of you. It's all benefits! What events, fictional or real, inspired the text? In which state of mind was it written? What does the writer expect? What does he/she want to convey? Which emotions does the text bring to mind? Is there an emotional development throughout the song? If there is, why and when does it happen? I know I'm repeating myself, but the general idea is to try to find out the intentions behind the song so you can assess the pertinence of the performance during the takes and also help the performer to get into character. This preliminary work might seem useless but, trust me, it's carried out for almost any big production where a musical director, vocal coach and what have you are involved. And here, once again, you as a home studio owner, can make use of that great advantage you have compared to the productions in expensive studios with all the gear you can dream of: you have all the time in the world, so make good use of it. To finish this article, I remind you that if you happen to be a lone ranger writing lyrics, composing, producing, performing and recording music all by yourself in your home studio, you can still use the recommendation above using the method described a couple of weeks ago. See you next time to continue our adventures in recording!